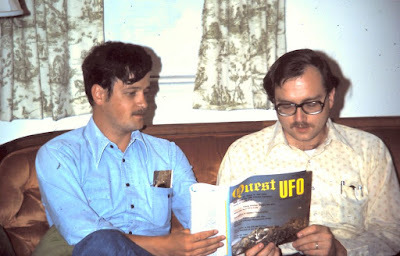 Kevin Randle (left) with the author in 1977. Weren't we young and handsome back them?!! "Quest UFO" was a short-lived publication edited by Randle, intended to take an objective look at the UFO phenomenon..
Roswell in the 21st Century, which never insults one's intelligence, is noteworthy for being the first recantation by a major figure in the controversy, now nearing its fourth decade. "Recantation?" That's a pretty strong word. 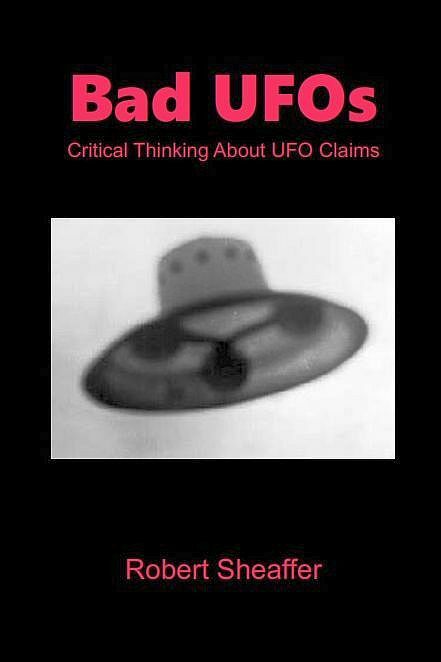 In my Bad UFOs book, I quoted Karl Pflock's 2001 book Roswell – Inconvenient Facts and the Will to Believe. Pflock demonstrated inconsistencies such that of the just four people publicly identified as witnesses to alien bodies, “not one of the purported firsthand witnesses to alien bodies and a lone survivor is credible. Not one.” (Pflock, p. 118-120). Randle was initially taken with what seemed to be credible evidence. Eventually (as I did), he grew doubtful of that evidence, especially as it concerned the supposed recovery of dead aliens. Of the eight claimants (he spoke directly with all) who said they had observed such bodies, Randle writes, "not one [..] turned out to be telling the truth." So Randle has raised the number of those who lied about seeing alien bodies at Roswell from four to eight, and there never were more than eight. This completely undercuts the need for bizarre ET or non-ET explanations for alleged alien body sightings at Roswell. Stalin and Mengele sent in deformed children in a Commie Nazi saucer: Annie Jacobs. The U.S. Army flew in dwarfish captured Japanese pilots in a bizarre craft: Nick Redfern. The Air Force dropped crash test dummies in the desert: U.S. Air Force. All of these highly implausible explanations are unnecessary, because there are no truthful accounts of alien bodies at Roswell to explain. Randle doggedly pursued the Holy Grail of alien evidence at Roswell for more than thirty years. When he realized it wasn't there, he was brave enough to admit it. Randle and I evolved, if separately, in the same direction: initial sympathy, growing doubt, at last a virtual certainty that whatever took place in New Mexico nearly seven decades ago, a crashed spacecraft did not precipitate it. Nor, for that matter, did a weather balloon. Major media - not just the usual tabloid papers and television shows - will pick up the story and recount their own investigations, which will confirm the ufologists' findings. We discussed many things about UFOlogy. I won't take the time to summarize them, you can listen to the show above. Randle is pretty skeptical about alien abduction claims. I asked Randle if Clark is correct that Randle had interviewed all eight persons who claimed to have seen alien bodies, and found none of them were "telling the truth." He confirmed it. I asked Randle, if he no longer thinks that the Roswell incident was extraterrestrial, what does he think it was? He said he really doesn't know. It wasn't E.T., but it wasn't a Mogul balloon, either. Randle then launched into a critique of skeptics being unskeptical because they insist that the debris found was from the once-secret Mogul spy balloon project, when the evidence supposedly proves that it was not. Thus skeptics are, he says, as illogical as the ET believers. I recalled that there had been some claims that the specific Mogul flight cited as the source of the Roswell debris could not have landed where that debris was found, because of wind directions and such. But that was not what Randle was talking about. He insisted that Mogul's Flight 4 was never launched, because there is no official record of its launch, and a researcher's diary entry suggests that it was not launched. Now I had not been following the details of that argument and could not argue against it. I said that I did not insist that the debris must be from Mogul, if it could be conclusively shown otherwise. Randle himself had stated that balloons carrying radar reflectors were being launched all over the country, on a regular basis. I suggested that the Roswell debris could be from one of these. He insisted that it would have been immediately recognized if it were. Perhaps so, but perhaps normal objectivity might be lost in a time of Flying Saucer excitement. After that show, the debate over Mogul Flight #4 generated considerable discussion among skeptics on Facebook. The point was that Randle's argument is based on a particular interpretation of conflicting notes and data concerning Project Mogul, and is by no means an ironclad proof that Mogul Flight #4 was never launched. Much hinges on the interpretation of whether a "cluster of balloons," that everyone agrees was launched at that time, describes a complete balloon array as was apparently found. For those interested in the details, Tim Printy gives the full, convoluted story about the disputed Mogul flight, "Crashology's Last Stand." (scroll down to page 5). Randle has since written more about this. Be sure to read the comments for more debate on the Mogul controversy. In any case, it is far more likely that ambiguous record keeping has been misinterpreted and that Mogul Flight 4 was actually launched, than that some unknown craft of whatever origin crashed near Roswell. Christmas presents might be a bit late this year - Santa's helpers had a little accident. Happy Holidays to all!